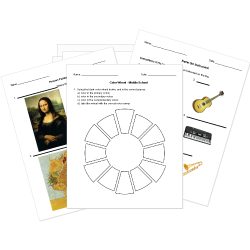 You can create printable tests and worksheets from these Kindergarten Arts questions! Select one or more questions using the checkboxes above each question. Then click the add selected questions to a test button before moving to another page. How many notes do these eighth notes show? Where do you find this symbol? Which one is a rest? How many beats are in a measure here? Mark all of the brass instruments. How many beats are in this note? The four musical instrument families are: strings, woodwinds, brass and percussion. How many beats does a quarter note get?